My Aeroflot flight to Moscow was delayed by several hours and I completely lost all hope in catching a transfer to Delhi, nevertheless, due to a large number of Indians traveling from the US to India on the same flight, the plane in Moscow waited for us, so we made it and arrived to Delhi not only with a minimum delay but also with all our luggage. Varun K., my classmate from Oxford, met me at the Indira Gandhi international airport and we went straight to his house. He and his family were kind enough to offer me and Dimitris an accommodation in Delhi and his hospitality went beyond any gratitude I can express in words. In the morning, after having a traditional/European breakfast with Indian pancakes (yet to get an original name for it), eggs and fruits, a family driver, Bholi, took me to town. My plan was to exchange the money and get a 3 G SIM card (keep in mind, as a foreigner, it is almost impossible to get a phone or a phone card in India); Bholi had to provide his documents and a passport-size picture for my application. 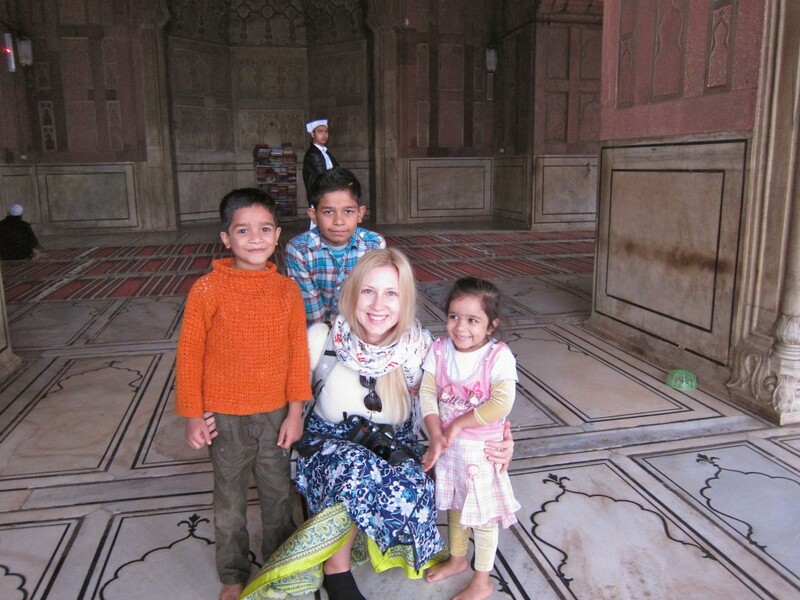 Before leaving for India, I created a few itineraries for Delhi. After speaking with some people who have visited India, I found out that most of them liked Mumbai the best, however, after reading William Dalrymple’s “City of Djinns: A Year in Delhi”, I developed a great admiration and respect for the capital of India, its rich Mughal history and multiple precious secrets hidden to a naked eye of a tourist, and likely of a local too. Not before I returned from my trip around India and Rajasthan and had a chance to spend 5 days looking into every corner of Old and New Delhi, did I start to appreciate this city. Delhi is considered to be one of the oldest cities in the world; it is also said that it was a site of ancient Indraprastha, home of the Pandavas from the India mythological epic Mahabharata (recent excavations in Purana Qila area of Delhi showed evidence of human habitation dating back over 3,000 years). The name Delhi is associated with the Maurya king Dhilu who ruled the area in 1st century B.C. But over the millennia, Delhi has been built and destroyed 11 times, each time renamed by its new conqueror. Reading and understanding the chronological history of the city, before browsing its sites, would make you really appreciate the beauty of this place. Don’t be surprised to accidentally walk into a tomb or ramparts of the ancient fort while in Delhi, likely, those are remains of one of the 7 old cities of Delhi. First city is Lal Kot (or Qila Rai Pithora). Anangpal, a Tomar ruler created the first regular fort in the area called “Lal Kot”, which was captured, in the 10th century A.D, by ancestors of Hindu king Prithvaraj Chouhan. Prithvaraj was a local hero famous for defeating marauding invaders from Central Asia and extending the city, thus, according to the historical records, he is the official founder of Delhi. You can still find some fort ramparts around Qutub Minar and Mehrauli areas. Second city is Mehrauli. In 1192 an Afghani king Muhammad Ghori defeated Prithvaraj and for the next 600 years, Delhi was ruled by Muslim sultans. Ghori left his slave, Qutub-ud-din Aibak as his viceroy and after Ghori’s death in 1206, Aibak proclaimed himself the ruler of Delhi and founded the Slave Dynasty in Mehrauli. Aibak’s most important achievement was starting the construction of Qutub Minar, a 72.5 m tall tower, built across 3 generations and completed in 1220. “Mamluk” (slave) dynasty ruled till 1290 and among its rules I should especially highlight Razia Sultana, who despite ruling for just 3 years, was the first Indian empress. Modern Muhrauli area of Delhi is quite an archeological gem to explore. Third city is Siri. Qutub-ud-din Aibak’s dynasty was replaced by Khilji (or Khalji) rulers who constructed a new capital at Siri, northeast of Mehrauli, supplied with water from a royal baoli (water tank) of Hauz Khas. The most prominent of 6 Khilji rulers was Alla-ud-din who extended the borders of the kingdom to the south of Narmada. Nowadays, Hauz Khas is a pleasant artsy area of Delhi, full of chic boutiques and fancy restaurants, but look deeper and you will find the remains of Madrasa built in a signature West Asian style, and not only Madrasa. Fourth city is Tughlaqabad. The last Khilji ruler was slain by a Hindu slave Khusro Khan in 1320, which resulted, as it is usually happens during the fall of dynastic lineage, in an administrative chaos. Ghiyasuddin Tughlaq (a Turk ruler) invaded Delhi in 1320s, started a new Tughlaq Dynasty and built a new city of Tughlaqabad, remains of which are still standing in the middle of the city. His descendant, Muhammad Bin Tughlaq, built the fort walls and created another city called Jahapanah (which enclosed the areas between Siri and Lal Kot). Muhammad Bin Tughlaq went into a history as a mad king who forced all citizens of Delhi to relocated to Daulatabad (modern Aurangabad) for 2 years, until shortage of water in a new capital forced them back to Delhi. Fifth city is Firozabad. Muhammad Bin Tughlaq’s son, Firoz created a new city, Firozabad or Feroz Shah Kotla (presently located near the cricket stadium in Old Delhi). The city was a large area with multiple palaces, mosques, pillared halls and multi-floored baolis (water tanks). Firoze Shah also brought a 1500 year old Ashoka Pillar from Meerut and planted it on top of worthy pedestal. 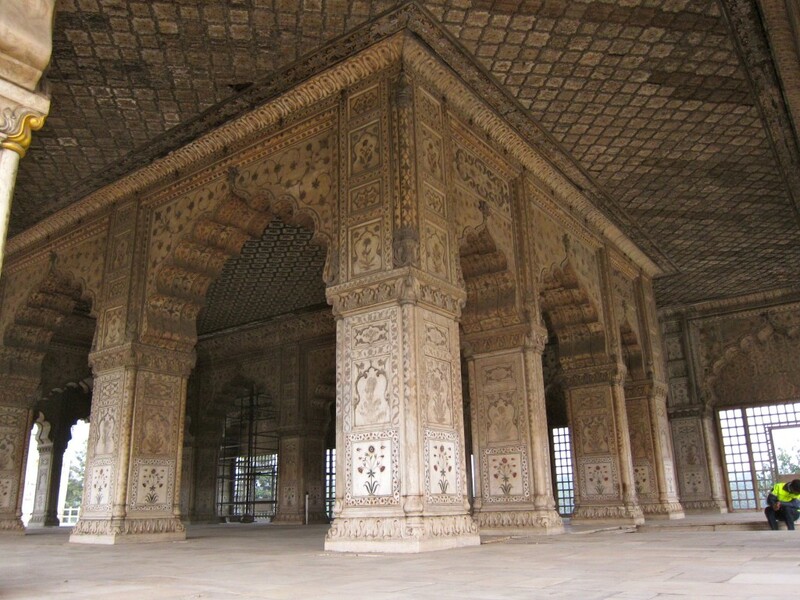 Firoz ordered the repairs of many old constructions, including Ghori’s Tomb, Qutub Minar, Saranj Kund and Hauz Khas (where his own tomb is located, next to Aibak’s Madrasa). After Firoz Shah death, the sultanate became weak and fell after Timur (Tamerlane) stormed through town in 1398. Angered by double-faced Hindu nature of Delhiwallas, Timur ordered the city to be looted, plundered, its citizens to be raped and killed. Thus Tamerlane opened the door to the Sayyid and Lodhi Dynasties, the last of Delhi sultanates. The rulers of both dynasties paid more attention into re-establishing the military power and political stability in the kingdom than building a new city, thus the only relevant archeological remains are tombs at Lodhi Gardens. The last Lodhi king was defeated by Babur in 1526 in the first battle of Panipat. Sixth city is Shergarh or Purana Qila. Babur started one of the greatest dynasties of the world – the Mughal dynasty (a word “Mughal” is a derivative of “Mongol’), which ruled India for over 300 years. Babur’s son, Humayun ruled the kingdom for a few years only to be defeated by Sher Shah Suri in 1540, who established a new city Shergarh (on the ruins of Dinpanah, built by Humayun), present Purana Qila. After Humayun came back to power, he completed the construction and proceeded to rule from Shergarh. After Humayun stumbled on his clothes, fell down the stairs at his Observation tower while hearing the bell for prayer and eventually died two days later, the capital was moved to Agra for a long time. Seventh city is Shahjahanabad. Shah Jahan (the mastermind behind Taj Mahal) returned to Delhi and re-established it as Mughal capital by building a new city- Shahjahanabad. He built the present Red Fort, Jama Masjid and all that is enclosed within the walls of Old Delhi. The wall with its three remaining gates is still very much visible and makes a fantastic site to visit. The Mughal city fell to a Persian king Nadir Shah in 1739 and since then the dynasty went into a steep decline. The last emperor of India, Bahadur Shah Zafar was exhiled to Burma by the British for his role in the Great Mutiny of 1857. Eighth city is Lutyen’s New Delhi. After getting rid of the last king and experiencing continuous rebellious sentiments in Calcutta, it was time to move the East India Company to a new place – Delhi. The British architect, Edwin Lutyens drew up plans for a new city with wide boulevards and administrative buildings, thus, New Delhi was born. After refreshing a story of Old Delhi in my mind, I dove into the city’s magnificent sites to explore and live the history. I started at Nigambodh Ghat – the oldest burning ghat in Delhi for performing Antyesti (Hindu funeral rites) and one of the busiest too. It is believed that the Ghats were established by the oldest Pandava brother, Prince Yudhisthira, the kind of Indraprastha. 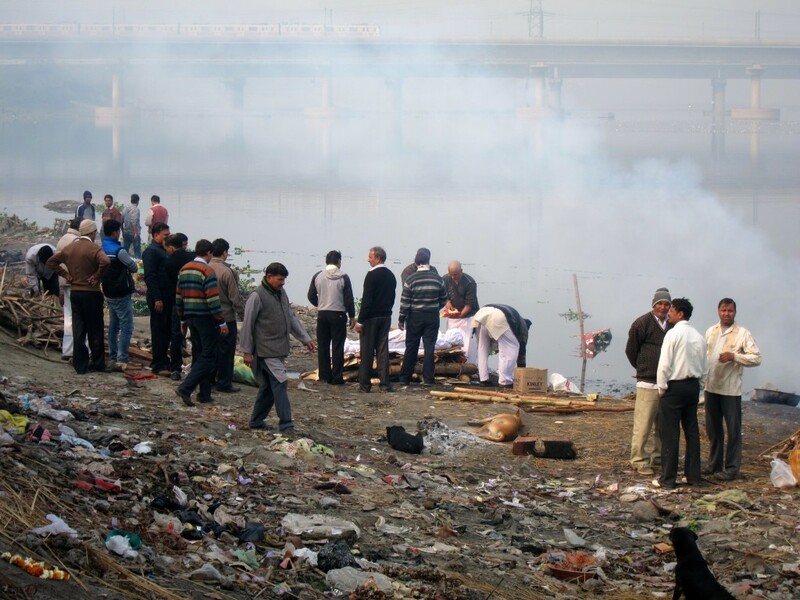 They say, about 50 funeral pyres burn there every day, and perhaps it is true, however, on the morning I got to the Ghat, there were no more than 15 fires, both – in the special niches on the ground and along the Yamuna river bank. 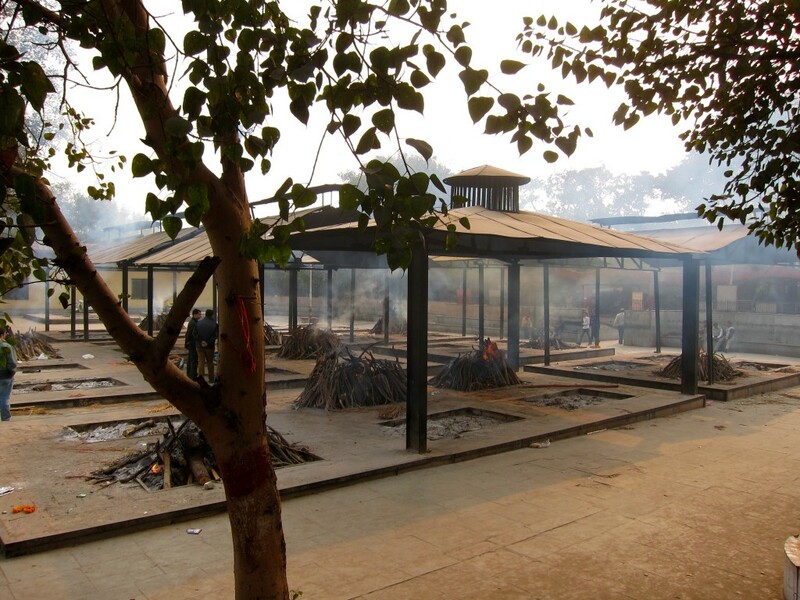 In Hindu religion, women aren’t allow to attend a funeral, in order to avoid being carried away with their emotions and thus disrupting the solemness of the procession; and indeed, there were very few people at the Ghat, not crying but quietly sitting on the benches not far from the burning pyres. I didn’t stay there for long enough to observe the entire funeral ceremony; after walking around and taking a few photos, Bholi picked me up to go to the Red Fort. 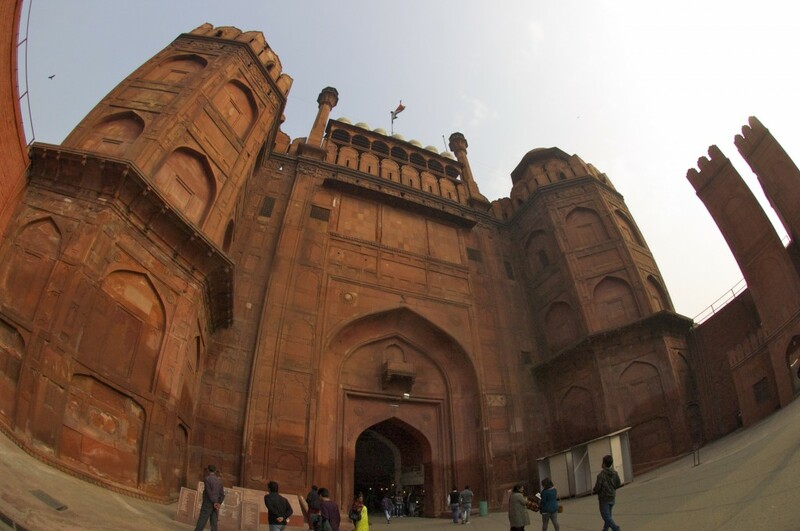 The Red Fort (also known as Lal Qila) is one of the Delhi’s top tourists sights. 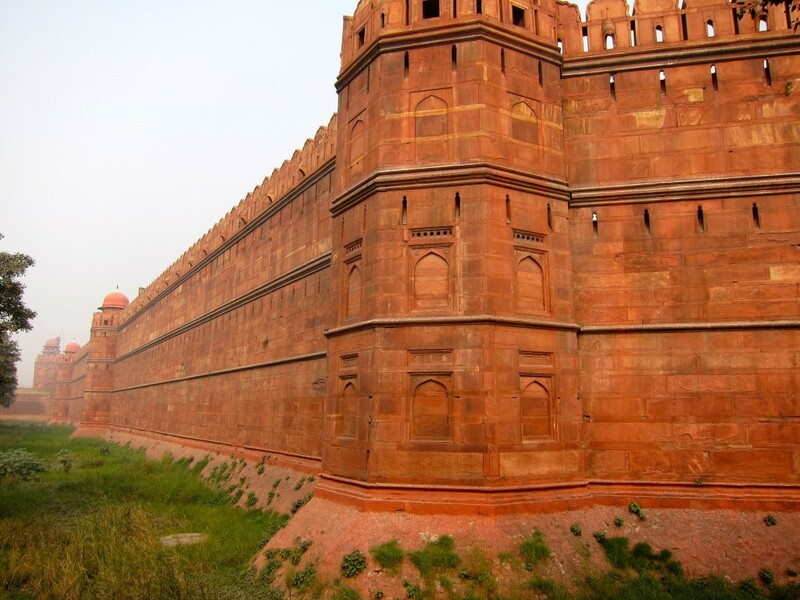 A huge red-sandstoned fort was built by Mughal emperor Shah Jahan from 1638 – 1648, his two other creations, Taj Mahal and Jama Masjid, are also world famous. If you drive around the dramatic 18m-high walls of the fort it seems enormous, however, the entire “inhabited” area is quite small. Built at the hight of the Mughal power, the fort’s buildings were flushed with gold and precious stones, however, the riches of the empire were long gone even before the last emperor, Bahadur Shah Zafar came to power. He, himself, was a “pensioner” according to the East India Company’s record which paid him a pension. After the last Mughal emperor was exiled to Burma, the fort was used as a stationary base for the British solders who cleared up all the buildings within the fort and built ugly barrack blocks instead. After paying an admission fee of Rs.250 and hiring a guide for Rs.400, I went in. Beautiful Lahore gates and Chhatta Chowk greats you to the fort as you enter. 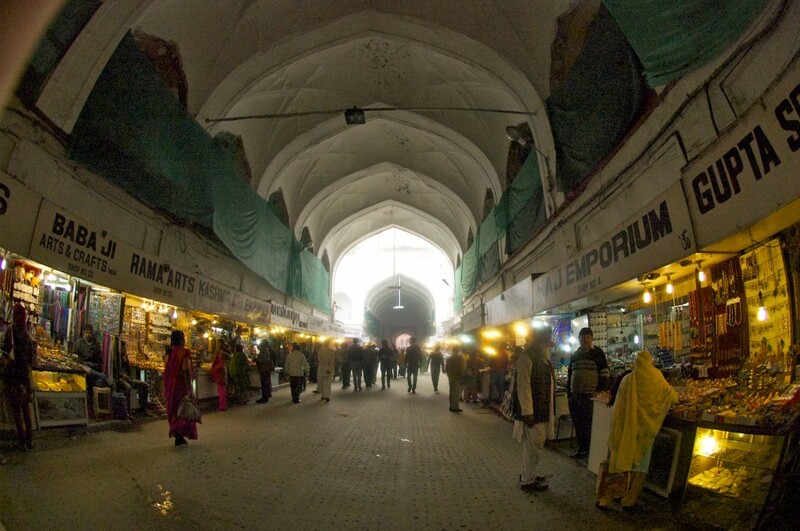 Chhatta Chowk (a covered bazaar) used to be a place where females living in the fort (Shah’s wives and multiple concubines) could shop for silk and jewels. No men were allowed to that area, unlike today, when 80% of all tourists in the fort were males. 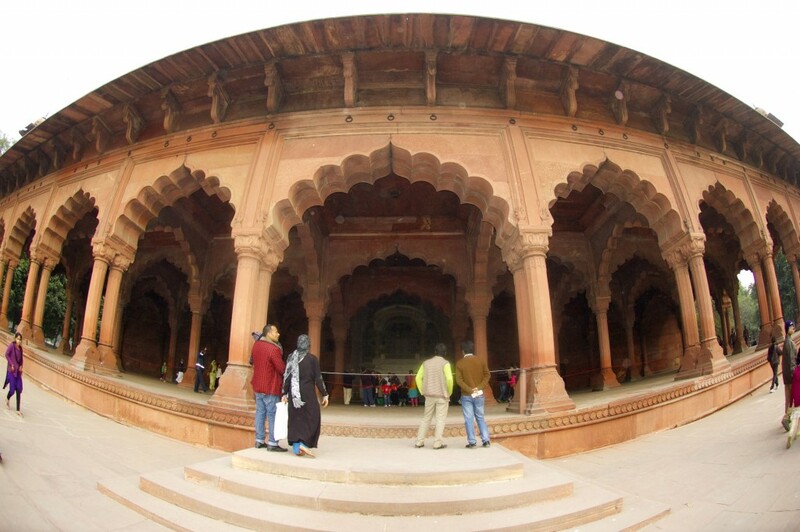 a beautiful red-stoned Diwan-i-Am (Hall of Public Audience), where the King attended his subjects; it has a marble platform with an emperor’s throne. Diwan-i-Khas (Hall of Private Audience) where the king received special guests and attended parties. 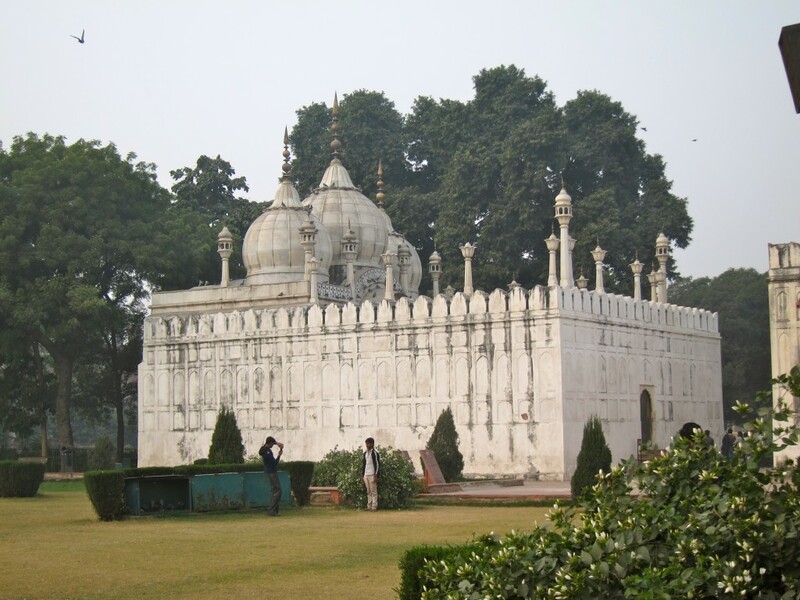 It is a stunning, white marble pavilion which used to be decorated with precious and semi-precious stones; It also housed a famous jewel-studded Peacock Throne, which was taken by a Persian king Nadir Shah in 1739. Khas Mahal (Private Palace), which was divided into three rooms – one for praying, one for winter and one for summer. It was the King’s private residency and they say, it had a few underground tunnels going to different places in Delhi and even one – to Agra itself. 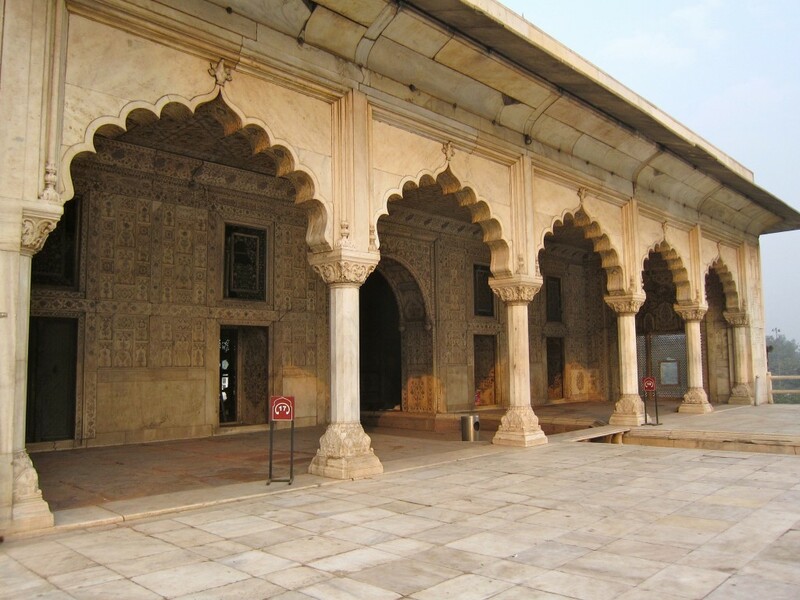 The tunnels were large enough to accommodate horses so, if danger was inevitable, the king would escape on his horse to the old capital of Agra. Rang Mahal (Color Palace) – a prime residency for the Emperor’s main wife, the Mahal’s interior was once lavishly painted but nothing is left of its previous splendor. Mumtaz Mahal (Jewel Palace), a 6 room Emperor’s harem, which now hosts a small museum with some paintings, calligraphy and armory. 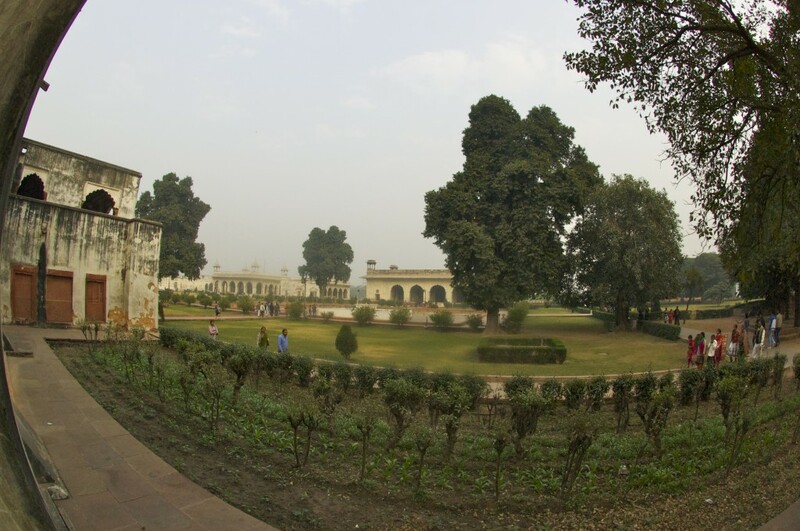 And obviously, there is no Mughal palace without a beautiful garden (as i assume it was beautiful in the XVII century) and large open hammam with a basin in the middle for the Emperor himself. 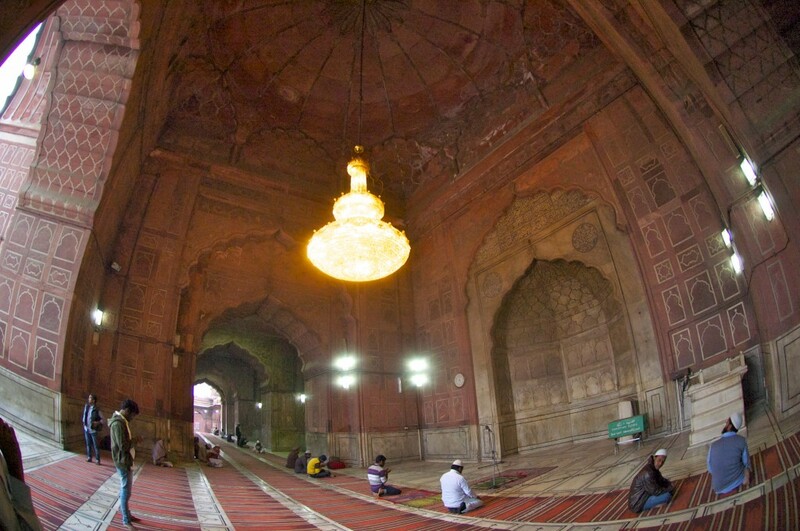 One of the additions to Red Fort, which was built later, by Shah Jahan’s son – Aurangzeb – was a Moti Masjid (Pearl mosque), a beautiful and delicate structure next to the closed hammam. Unfortunately, this and all other buildings are closed for visitors so you can enjoy them only from the outside. Needless to mention the underground compartments – they were very useful in summer time, when heat forced the King’s court to move underground where temperature was by 10-15 degrees cooler. Most of the buildings look like pavilions with no walls but the columns. It is easily explained by the nomad origin of Mughal’s culture, a tradition to live in tents and conduct their business in the field. This, in a great way, influenced the style of the all Mughal constructions. When you enter the Diwans, look up and see the loops attached to the upper bars – they were used to hook up the drapes and curtains in order to keep the heat out and secure privacy too. While my guide was walking with me and telling me about the Fort, a group of 30-35 male onlookers gathered around us and followed us wherever we went. My guide had to stop his tour several time in order to tell them to disperse but to no avail. Tip: please read more about Red Fort and Mughal rule in India, in this way, you find it easier to appreciate the beauty and inner meaning of those few things that are left to see. Opposite to the Red Fort is Jama Masjid, or so my travel guide said, however, without help of my driver, i would have never found it, due to either a new Metro station construction in process or a huge Chawri Bazar that spreads from the main road all the way to the Royal Mosque. It is an interesting place to visit (or likely, briefly cross). Once, this area was famous for its dancing girls and whore houses, however, now it is one of the main wholesales markets of the city, with everything from men’s underwear to car’s engines on sale. 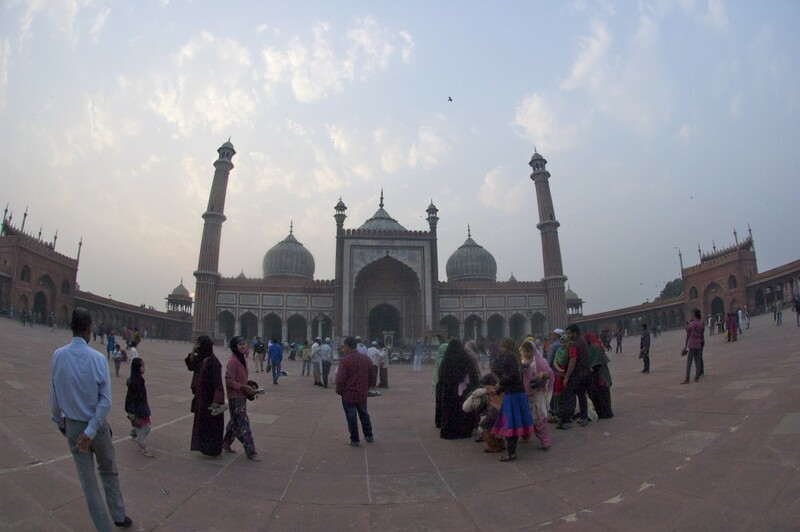 Jama Masjid – Delhi’s (and India’s too) largest and most beautiful mosque, also built by Shah Jahan from 1644-1658. I have visited a few mosques before in Lebanon and Egypt but i haven’t seen anything more beautiful than this one. It was large with a huge square in front of the main paying hall, able to accommodate up to 25,000 people. The mosque is crowned by 3 proportional domes, constructed out of red stone and white marble and guarded by 40m-high minarets. The fee is 0, however, because I had two camera and a guide I had to pay Rs.600 for myself and a driver. I wish i spent more time there, but i could see that Bholi started to get irritated and after snapping a few pictures, we left. Similar to China, many people wanted to take pictures with me, and I spent more than 20 minutes posing with many children and adults. Tip: you must take your shoes off while in mosque but you dont need to leave them outside, you can carry them in your bag or in you hand. A man outside might “force” you to leave them with him, likely for an extra pay of Rs 10 (or Rs 50 as he demanded from me). I had to return to Varun’s house, pack my day-pack for a trip to Varanasi and depart for New Delhi Train Station. I must admit, train station was quite a scene. People were numerous but their so-called “luggage” was truly uncountable. 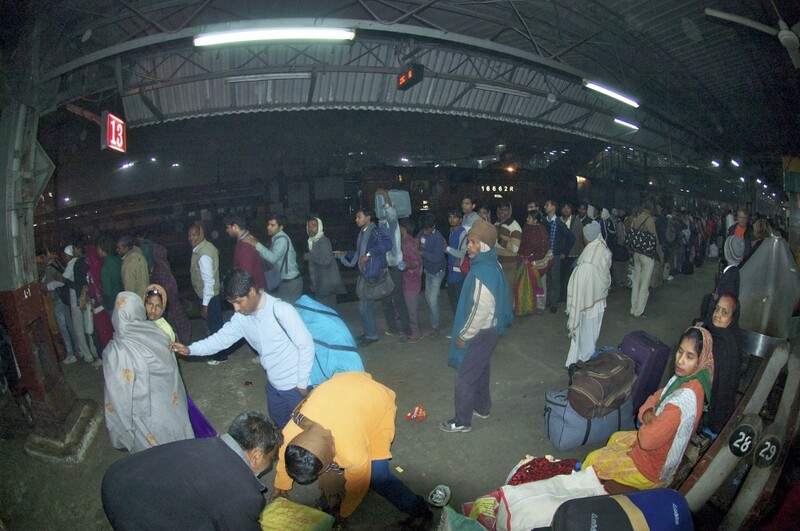 Because of the different classes of trains, the poorest people travel by cheapest class which means – no tickets sold, you run and occupy the first available spot. It is not a human way to travel standing or sitting on your own luggage for days at end, but it is an affordable one. As of now, i am settled on my bench of my class 2 cabin, after a sleepless night in Delhi-Varanasi train. I was tired and jet-lagged, but the roaches roaming around the cabin killed all my desire to sleep. It is time to get introduced to the holy city of Varanasi. This entry was posted in Asia and tagged 1857, Aeroflot, Ala-ud-dun, Anangpal, Ashoka Pillar, Aurangzeb, Babur, Bahadur Shah Zafar, Chatta Chowk, Chawri Bazar, Chhatta chowk, City of Djinns, Delhi, Dhilu, Diwan-i-Am, Diwan-i-Khas, East India Company, Feroz Shah Kotla, Firuz Shah Tughlaq, Great Mutiny 1857, Hauz Khas, Hinduism, Humayun, India, Indira Gandhi Airport, Jama Masjid, Khas Mahal, Khilji, Khusro Khan, Lal Kot, Lodhi Dynasty, Lodhi Gardens, Lutyens, Mahabharata, Mamluk Sultanate, Mehrauli, Moscow, Moti Masjid, Mughal, Mughal Dynasty, Muhammad bin Tughlaq, Muhammad Ghori, Mumtaz Mahal, Nadir Shah, Nigambodh Ghat, Pandava, Peacock throne, Prithviraj Chauhan, Purana Qila, Qila Rai Pithora, Qutub Minar, Qutub-ud-din Aibak, Rajasthan, Rang Mahal, Razia Sultana, Red Fort, Sayyid Dynasty, Shah Jahan, Shahjahanabad, Siri, Tamerlane, Timur, train, Tughlaq Dynasty, Tughlaqabad, Varanasi, William Dalrymple. Bookmark the permalink. Welcome to Delhi. I suspect the breakfast pancakes you mentioned were parathas.